"Little is known about Loyalist Peaceful Protesters which has no public profile. It must be a matter of concern that a faceless, unaccountable organisation can take over the streets and damage livelihoods at enormous cost to the public purse. There is a need for common sense to prevail on the issue." Unionism needs to lose its loathsome cowardice, stand up to loyalism and demonstrate real courage and real leadership. Loyalism is not immune or exempt from the rules that the rest of society lives by. Other people have rights and it's time they were spoken for. Let's not have Belfast or Northern Ireland become a cold-house for tourists, shoppers, wealth and job-creators. And let's ask as Ian Coulter did: "Where are the rights for the people trying to trade and build businesses?" 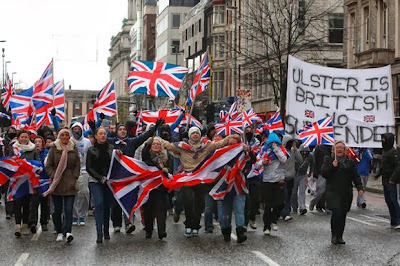 Previous posts on loyalist protests and their affect on Belfast and wider Northern Ireland here and here.